Christian Heroes: Then & Now titles is now taking place in CUBA! Due to Cuba’s isolation over the past decades, believers there understand ‘missionaries’ to be church-planters within their culture. They are not aware of the rich cross-cultural missions history of the Church outside their borders. 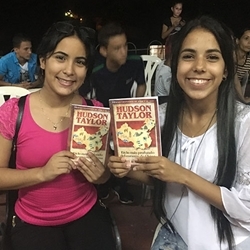 300 copies of “George Muller” and 300 copies of “Hudson Taylor” have already been printed and distributed in Cuba, and there are plans to print thousands more (plus additional titles from the Christian Heroes: Then & Now series) in the coming months. 100% of your tax-deductible gift will be directed to this long-awaited opportunity.